For most moms, it’s important that we have easy-to-prepare but filling recipes in our arsenal. We’re shaking things up with a delicious serving of chicken fillet – perfect for lunch at school or in the office. Ready, set, fry! 1. For the sauce, combine cream, lime juice, wansoy and garlic in a bowl. Season with salt and pepper. Then, set aside. 2. In a bowl, soak the chicken in milk with salt and pepper to taste. Refrigerate for two to four hours. 3. Prepare 3 bowls for the breading. Combine the flour, cayenne pepper and garlic powder in the first bowl. 4. Place the eggs in a second bowl and the breadcrumbs in the third bowl. 5. Drain the chicken strips and dredge in the flour mixture. 6. Dip in the eggs and coat with bread crumbs. 7. 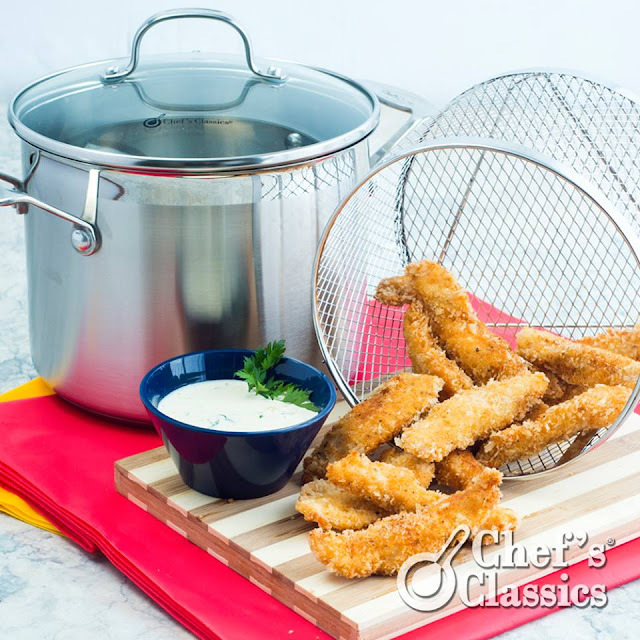 In a Chef’s Classics Fennel Deep Frypan, fry the chicken over medium heat until golden brown. 8. Transfer to a plate with paper towel to drain excess oil. 9. Don’t forget to serve with the dipping sauce.